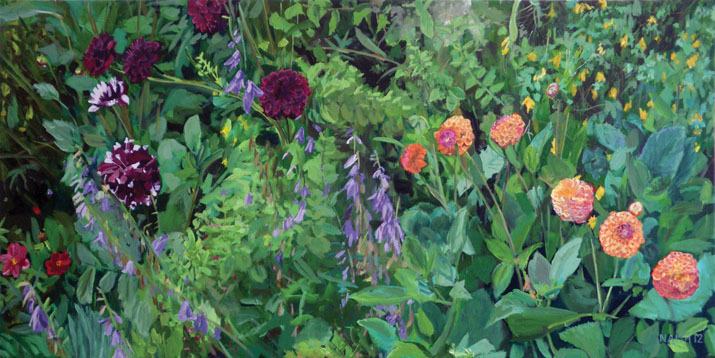 This is the final and largest picture in the series of paintings for the annual Luton Hoo Walled Garden exhibition. The image is based on a photo taken up in the beautiful Derbyshire village of Tissington. I was getting slightly concerned about finishing this one in time – and indeed I did apply a few brush strokes on the day of submission. The turning point was when I detailed up the flower heads. This gave the piece centres of interest and it looked finished enough despite the loosely painted background. Indeed my mother remarked that it was better than the photo it was based on – praise indeed.